Leave it to singer/songwriter David Gans, who also happens to host the Grateful Dead Hour radio program, to put the spotlight back on the Grateful Dead's stellar songwriting and glorious lyrics. This is an aspect that has long been forgotten by the jam band scene, and Gans deftly emphasized it on Stolen Roses, an exquisite collection of Grateful Dead songs performed by a variety of artists. Might as Well, Gans' latest project, blossomed out of the Stolen Roses recording sessions with the a cappella group The Persuasions. Yet, this wasn't their first contact with the Grateful Dead's music. They had opened for the Jerry Garcia Band in 1977, and the notion of their recording an album of Grateful Dead songs had been floated several years ago, though it didn't come into focus until Gans' involvement. The biggest problem with Might as Well, if there is one, is its length. Clocking in at nearly 70 minutes, it's a hefty piece to grasp fully, and at first, it can be a bit overwhelming to comprehend. Nevertheless, perseverance is the key — and unquestionably a must — as there is some fine music to be heard. For example, the title track rumbles along a '50s style doo-wop groove, and Liberty is transformed into a rousing gospel number. The highlights, however, are by far the gentle Garcia ballads. Here, The Persuasions take their time in traversing the terrain, allowing each little nuance of the song to magically spring to life through their majestic vocalizations. Sugaree, Black Muddy River, and Ship of Fools are most certainly the cream of the crop. They're stunningly beautiful creations that tickle the ear and tantalize the brain with their rapturous elation. 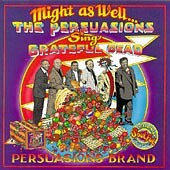 Though there is some instrumentation added to a few of the tracks (courtesy of Gans, keyboardist Vince Welnick, bluegrass legend Peter Rowan, and others), it's the songs and The Persuasions' sublime vocals that truly make this one a keeper.